The American Museum of Natural History deftly uses digital technology to foster connections between the public and scientists, sharing and broadening scientific knowledge. The American Museum of Natural History was formed in 1869 and conducts scientific research, offers educational programming, and develops and presents exhibitions to discover and share knowledge about human cultures, the natural world, and the universe. More than 200 scientists are associated with the Museum’s research; they conduct expeditions across the globe and also use the Museum’s more than 33 million objects to delve into questions about the Earth and the larger universe. As a scientific institution at its core, the AMNH integrates new technologies into its programming, departmental work, and educational offerings. Using the AMNH website as a launch pad, visitors can explore many examples of digital media used to enhance and animate the Museum’s core scientific purpose. A key use of technology by AMNH is in its educational programming, linking scientists and Museum resources with educators and their students. For example, Ology is a science learning website for elementary and middle school youth, providing videos, interactive features, and games in subjects like archaeology, climate change, and the brain. Online courses for educators draw from the museum’s collections and staff expertise, and are approved for continuing education and graduate credits. Live streaming is available for select programs, such as the annual Isaac Asimov Debate, and these presentations are then archived on Amnh.tv, the Museum’s robust video channel. 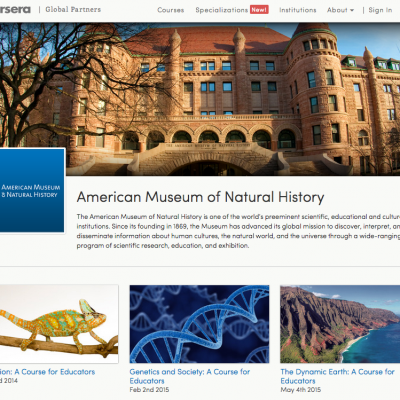 On Amnh.tv, users can also find short videos about exhibitions, lectures, research documentaries, and scientists’ video profiles, among many other resources. A Microscopy and Imaging Facility serves all departments by providing expert support and state-of-the-art imaging instruments and image analysis software. 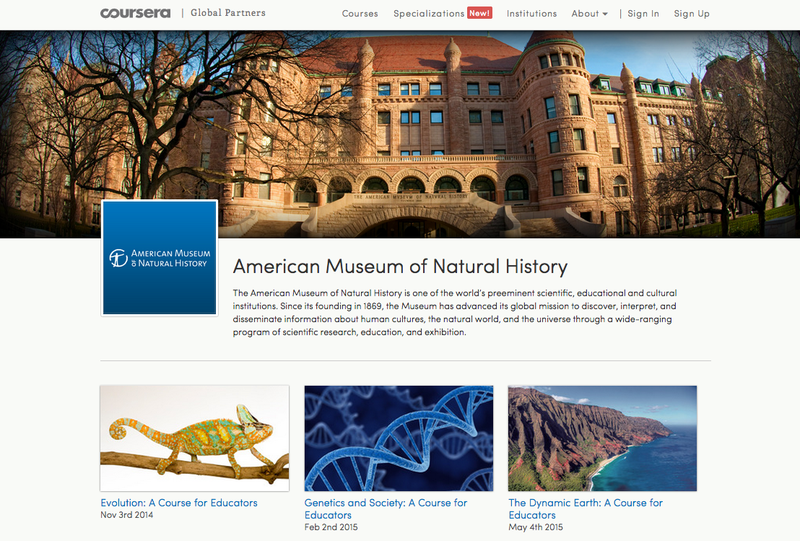 And, in partnership with Coursera, AMNH is offering on-line courses for educators in subjects like geology, evolution, and genetics. 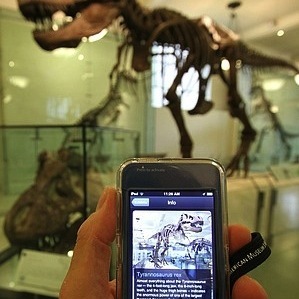 AMNH has been a relatively prolific app generator. Exhibit-specific mobile phone and iPad apps provide insights, games, and media for in-depth engagement with current exhibitions. Apps like Dinosaurs and Creatures of Light: Nature’s Bioluminescence include photographs of the Museum’s holdings and can be updated as scientists make new discoveries. For researchers, AMNH offers departmental web pages that showcase relevant collections, archive research reports, and describe work in progress. Behind the scenes webpages share exhibition preparations, museum maintenance, and collection preservation.